Over the past month, I’ve really tried to take a hard look at how I personally do marketing online. Specifically, I’ve been trying to create processes that I can use at any company as I progress through my marketing career. I wrote about how I onboard myself at a new company, but my goal with this post is to dive a bit deeper. 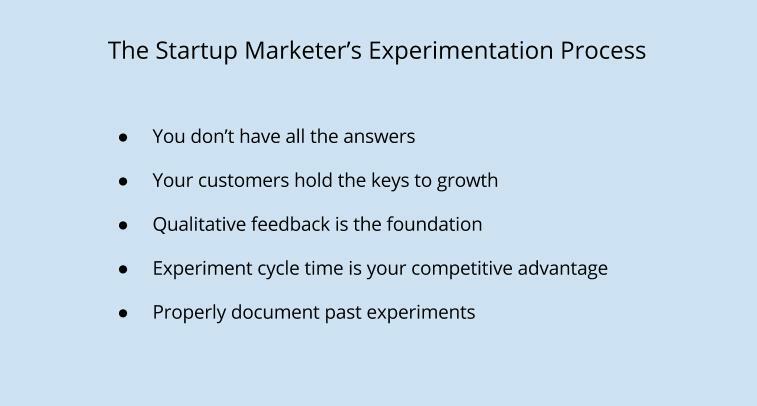 Before I jump into specifics, I believe that establishing a process around marketing experiments is one of the biggest competitive advantages you can have. So many marketers try tactics, and never document results (I’m guilty of this.) Even worse, there’s no “formula” to how you learn. This is bad, and I’ve been trying to change this, so I figured I’d share my process around experimentation. It’s still a work in progress, so any feedback is appreciated. One of the biggest problems with running marketing experiments is how the experiment ideas are generated. Ideas are a dime a dozen, and getting current employees to come up with a backlog of ideas to test is a recipe for disaster. I’d like to believe that my intuition for how these marketing tests should be run is good, but the problem is that I’ve most likely spent dozens of hours using the product, I know every flow inside and out, and it’s tough for me to relate with the average user. This is especially prevalent in onboarding flows. If you have plans of growing a sustainable business, you must charge money. Who pays you money? Your customers. Put simply, your customers are the keys to your success. It’s your job to find out what they love/hate about your offering, and improve based on this feedback. This is absurdly simple, yet extremely important. One of my favorite things to ask customers (or potential customers) is “Where do you go online to stay up-to-date with your industry?” From a marketing perspective, I can learn exactly what channels I can reach them with. If it’s a popular blog, it’s probably a good place to guest post, if they spend their time on Twitter, perhaps Twitter ads could work. I like qualitative feedback. It’s rich with insight, typically comes straight from customers, and gives you a much better starting point to run experiments from. This is especially true as a young company. Team #1 decides to call customers, setup SnapEngage or Qualaroo on the site, and goes straight to the customer to find out what’s blocking them. Team #2 decides to dig around in Google Analytics, Mixpanel, or KISSmetrics. They take the quantitative approach, and create a backlog of experiments. My point here is that the experiments you run should have qualitative feedback as the foundation. You absolutely should measure results with analytics tools, but I highly advise that these tools are not the source of your experiment ideas. I’d rather hear a customer say that the onboarding process is confusing and ask them why, than dig around in analytics and be left to my own conclusions. Business is a bit like war without killing (hopefully), but I still want to crush my competition. What crushes your competition? Learning faster than they do. On the other hand, Lyft runs 5 marketing experiments a week, and they consistently pick a winner 10% of the time. Who wins? What measures success? If it’s an A/B test, what’s the confidence level and sample size? A business that’s always testing is a business that’s always learning. Make no mistake, documenting past experiments is boring. Oftentimes marketers like to keep the results in their head (once again, pointing at myself), but proper documentation is critical, especially when hiring additional marketers. Document key metrics, the dates the experiment ran, and whether the test was a winner, loser, or had no effect. A spreadsheet is the best solution I’ve found so far, but it’s easy to forget about past experiments. Typically marketing teams that don’t document results end up running the same test many times. I’ve been thinking about building software to help with this, if you’re having trouble too, just email me or tell me on Twitter.